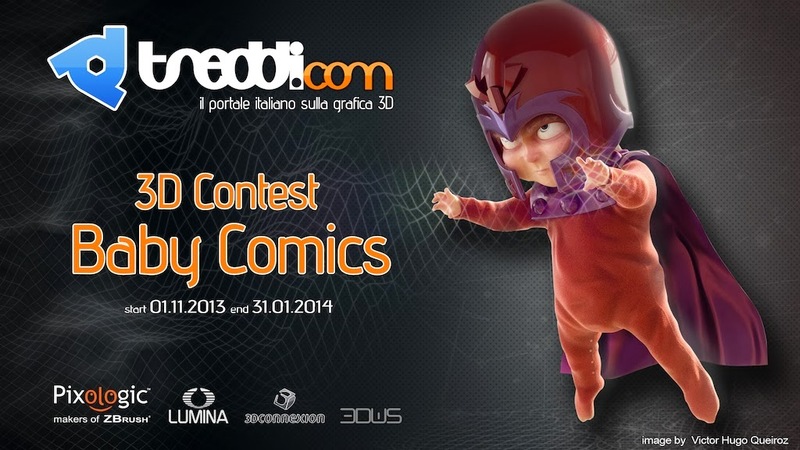 the first Italian site about 3D computer graphics - Treddi.com has launched a new contest for 3D artists called Baby Comics. The contest will on Treddi.com forum from 01.11.2013 to 31.01.2014. The purpose of the contest is mainly to allow Treddi.com forum members and artists around the world to share their art, creative ideas, tips and ultimately become more skilled while attempting to challenge the problems related to the creation of CG images. All the participants must open a new thread in the forum Baby Comics with title: 'username - Baby Comics' where they can periodically share their work in progress, receive comments from other users and ask them for advice. The final image must be published in the same thread before the midnight of the last day of the contest and must be at least 1920 pixel wide. The theme of the contest is Baby Comics: the participants must imagine the "baby" version (known also as "super deformed") of one of the characters of the comics. The task required is to represent the main character rendered and texturized, but it will be also appreciated if you realize a complete scene with background and environment. Fabio Santoro - Matte Painter at Squint/Opera.